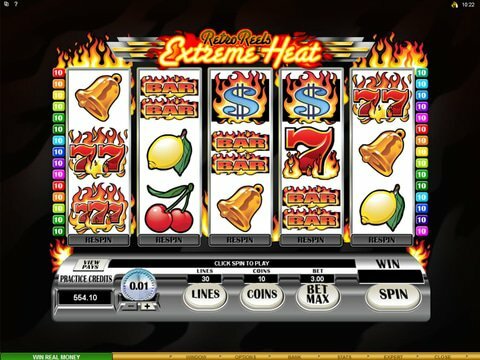 If you want something to do for fun from your Canadian computer or mobile device, then be sure to check out the Retro Reels - Extreme Heat slot machine. This is a fantastic way to pass the time with a fiery take on a classic slot spread out across five reels and a whopping 30 paylines. You'll find bars, sevens, lemons, cherries and more - but this isn't your average machine! Review it right here on this page with no download and no registration required with the Retro Reels - Extreme Heat free play slot demo. Unlike its predecessor which was simple in nature but fun, Retro Reels - Extreme Heat offers a large betting range to fit into the budgets of those who want to play for real money. It starts at a penny and climbs up to $112.50. There are some cool features here, too! While the last version didn't offer up a wild, this one does in the form of a Dollar Sign. It fills in for regular icons to provide more chances to win. There's also a scatter that can pay any, but it will also offer up as many as 20 free spins during which all of your wins will be doubled. Another great title that's an amazing twist on a classic - and one that is probably better suited for real money play - is Sizzling Hot from Novomatic. There are five reels and five paylines filled with fruits, and the goal here is to match three in a row to win. There aren't any wilds, free spins, or bonus rounds to get excited about, but the scattered star will pay out if you see three or more anywhere on the screen. It truly is simplicity at its finest, and it carries with it the chance to win as much as $100,000 in cash.